Should Astros buy low on Jason Hammel for 2017? Should the Astros take advantage of the market and add veteran Jason Hammel to the rotation? Before the offseason began, one of the Astros’ primary needs was rotation help. Key starters Dallas Keuchel and Lance McCullers suffered injuries. The rotation suffered as a result throughout the season. There was little debate about the team’s need for a quality arm or two to add to the mix. Fast-forward to the beginning of February, and Charlie Morton is the only new addition. GM Jeff Luhnow found the asking prices for Chris Sale, Jose Quintana and Chris Archer to be prohibitively steep. Though the rumors continue to linger around Quintana, the boys at Talking Stros discussed this last night. Only Keuchel, McCullers and Collin McHugh guaranteed rotation spots this season. There may be room to add another pitcher to the mix. Veteran right-hander Jason Hammel remains arguably the best starting pitcher on the free agent market. He changed agents in December and could be had for a reasonable price. The Astros have talent in their starting pitching ranks, but they lack lots of experience. Morton possesses the most experience, having pitched in the majors in parts of nine seasons. He has never made 30 starts in a single season. 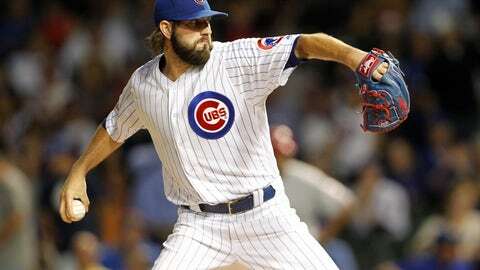 The 34-year-old Hammel has seen action across 11 seasons and has pitched more than 600 innings more than Morton. This degree of experience is something the rotation is missing. Hammel’s performance over the past few seasons is also a plus. He posted a 15-10 record in 2016 for the World Champion Cubs across 30 starts with a 3.83 ERA. Going back further, he pitched to a 3.74 ERA across 31 starts in 2015 and a 3.47 ERA over 29 starts and one relief appearance in 2014. He’s also versatile, having made 58 relief appearances during his 11 big league seasons. Hammel also brings consistency and durability to the table. He’s been good for solid innings without major injury concerns, which any team can use. After Keuchel and McCullers endured rough seasons last year, the value of Hammel’s consistency is magnified. Perhaps the biggest thing going for the Astros now is that Hammel remains unsigned in early February. As Spring Training gets closer, the likelihood of Hammel accepting an offer in the range of one to two years gets higher. The Cubs did not give him a qualifying offer, so there is no draft pick attached to signing him. It’s possible he could be signed for one year with an option for a second. Though Hammel has been a reliable pitcher over the past few years, he hardly represents a major upgrade to what the Astros already have. His career 4.42 ERA is mediocre at best, and at age 34, he’s unlikely to improve much. The Astros now have Morton, Joe Musgrove, and Mike Fiers to compete for the final two rotation spots and the long relief role. Adding Hammel to the mix could make for better competition, but could force Musgrove to start the season at Triple-A. Hammel may have experience, but Musgrove has much more upside. The presence of top prospect Francis Martes also could pose a problem. A strong start to the season could have Martes knocking on the Minute Maid Park door. Hammel’s presence on the roster could serve to block Martes’ path if the front office deems him ready. It’s also important to note Hammel’s ERA has trended in the wrong direction in the past two seasons. At age 34, further regression is a distinct possibility. It might be in the team’s best interest to stick with in-house candidates and not paying Hammel for similar production. Luhnow has taken advantage of the market before, most notably with the original Colby Rasmus signing. While it would not be out of the realm of possibility, it seems unlikely he would make a similar move for Hammel. Hammel could certainly help the team, bringing stability and a veteran presence. But he may not prove to be much of an upgrade over the options already on hand, making a match difficult. If Luhnow is going to upgrade the rotation, it will have to be via trade for it to make a significant difference.